I tried that set of modules and they worked, but I'm having a problem. Yup that is a real problem. I don think there are any objects that clears out a tables content, but I am not sure. But one could argue that the envelope is there to prevent playing more of the files than you need. 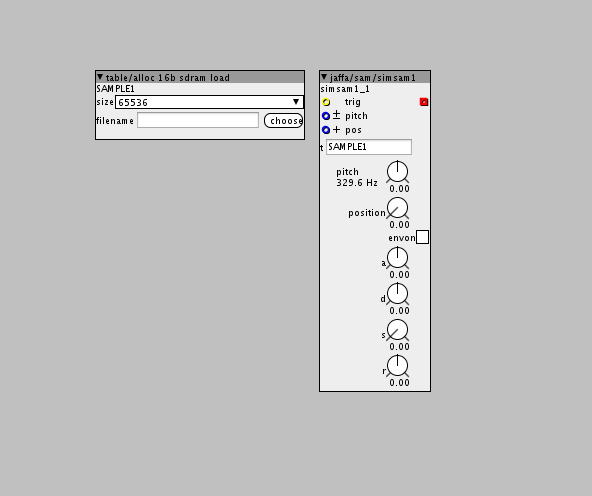 You could use the timer/pulselength object as in the helpfile to make sure the gate/adsr only is open when the part of the file you want is playing. Basically I created some directories in my SD card with about 200 drum samples I like. And I want to use that samples in whatever project I want to use them. Well, finally I ended loading a silent sample between samples. Didn't take much more processing and is fast enough... If the sample is playing I can hear a glitch when changing samples (did't happen with neither the other configurations), but I think a can live with that. 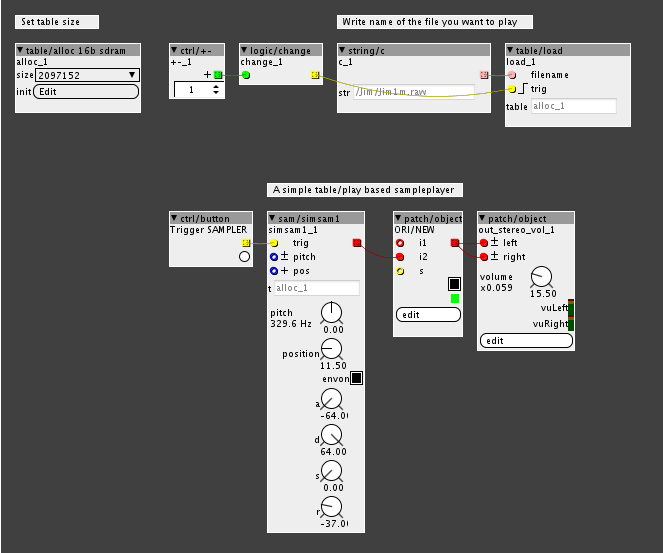 looking at the table load/save modules, I now see there are options to set "offset" and length. So I think it should be possible to make a "loading train" that loads the samples one by one into a table (names like drum000,drum001 etc), taking notice of the length and saving the start/end-positions in a second table (last write position plus 1 is start position, end position is read from start-position of next sample minus 1). Though, I need to know how to get the length of a file that's being read to declare the "load length". From there it should be easy to mod, morph and do anything with your samples..
A looper with overdub and feedback-control. -improved the code a bit for efficiency,but only works with 32-bit-tables! -the length of the loop is now stored with the last sample of the table. the length of the recorded loop on re-loading. alas, he saves the sample length of a sample that is being recorded and saves that into the table/an extra table, he doesn't get the samplelength from the file itself. But I'm pretty sure I saw some code somewhere where this is actually done.... but where...? Hey. Dr justice have made a seperate object for getting file size in samples. I implemented it into a table. Works fine. It has got a trigger function implemented, so when you load a new file when the patch is live, the table will send the new information to the filesize object. gotta go to work now, so maybe tomorrow..